Chapter 4 Page 14 posted. Snow and the boys make it to the top of Cape Adamant and find their prize ripe for the taking. As one commenter pointed out, Snow is going to be mad when she finds out she was lied to. 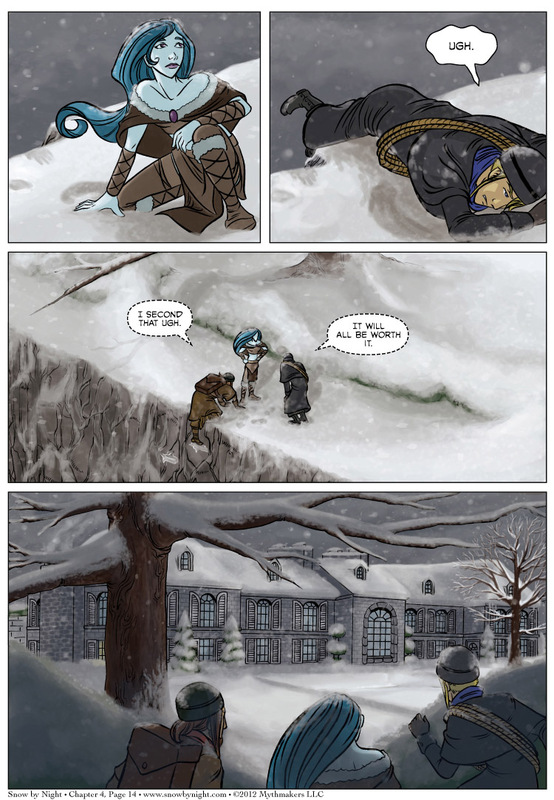 To see a preview of round one between Snow and Jassart, vote for Snow by Night on Top Web Comics. It would probably be quite sensible to only keep a few rooms warmed up in the winter. Or both. The cold and damp will wreck havoc on furniture. Wreak, not wreck. Stupid “smart”phone. Actually, you can spend time in this house. The manse is based off of the Château de Guilguiffin in Bretagne, France. You can stay there, as it’s now a bed and breakfast. The prices are pretty reasonable for staying in a French chateau. Yowza. Maybe when the kids are a bit older…! Thank you for this beautifully crafted story and I think this would be a wonderful comic for anyone who is Canadian or who likes early Cdn flavour in their stories. I am not Canadian, and Canadian themes aren’t particularly near-and-dear to my heart. Still, I aDORE this series! I’m very glad you’re enjoying our tale. We’ve done a lot of research to try and catch the feel for the frontier of Nouvelle-France. At some point, I would like to create a French mirror site for the comic. I just don’t trust my French to do it myself.